The fantasy season is over. Todd Gurley mugged you, he stole your winnings and what is left is the NFL playoffs and your wife is saying “Stephen, stop writing and put the laundry into the dyer already.” I’m sure that oddly specific situation applies to everyone, but fear not my friends with a few tips and sleepers for next season the gap between you and second place will be so big your league will think that they are looking at the AFC East standings. When Ty Montgomery gets hurt, and Jamaal Williams promptly follows suit and you look at your roster and see Aaron Jones your eyes dilate slightly and heart rate increases. This doesn’t happen with tight ends, knowing a good tight end sleeper is finding a dollar in your couch and not an extra 20 in your wallet. Still, those dollars in your couch can add up and can save your season in the right situation. They are especially important depending on your strategy on the tight end position. Personally, I believe there are two good strategies with tight ends. The Stud – You’ve got Travis Kelce or Rob Gronkowski, you roll them every week and they put up numbers. It’s good to have a sleeper tight end or two for bye weeks, injuries or when Rob thinks he’s in the WWE but it’s not a huge deal. Use them like Kickers – If you have the 9th-12th best tight end in your 10-12 team league that plays one tight end then you really should treat the position like you have 6-8 tight ends, the 1-2 on your roster and the 5 or 6 in a given week that are worth consideration from the free agents list. That said a sleeper tight end isn’t someone you’re going to hold while they do absolutely nothing, the position doesn’t have that kind of value. With that in mind here are 5 guys that were in the NFL this season that are trending upwards, that are undervalued and that you want on your roster next season before people realize their potential. This is a guy to watch. He is a free agent that needs to sign somewhere far away from Zach Ertz. If the Eagles somehow let him walk, the sky is the limit. The Philly media are high on him and so were the Eagles when they put a second-round tender on Burton after the 2016 season. 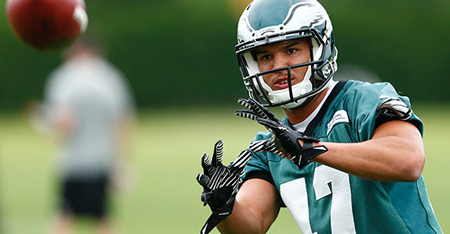 Currently, Burton is an impressive undrafted third-string tight end who has shown flashes filling in for Ertz. 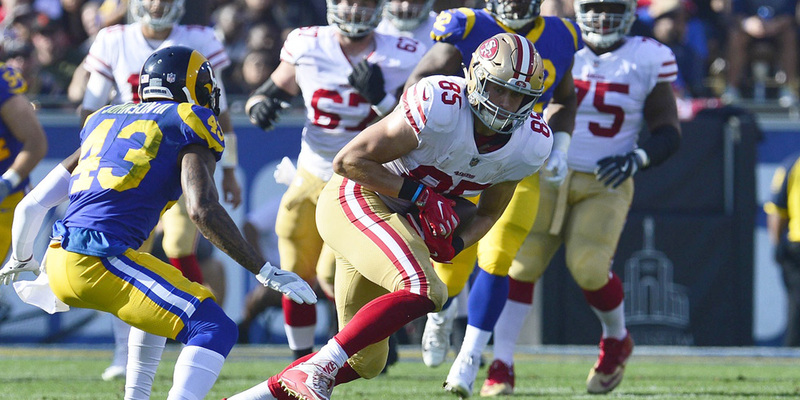 This year only re-enforced the notion that Burton is a breakout player waiting to happen, Football Outsiders rated Burton the 10th best tight end even in his limited role due to his 74% catch rate and great advanced stats. If Burton signs (or is traded) with a team that will start him he has huge fantasy potential in 2018. Anderson is behind C. J. Fiedorowicz on the Texans depth chart, but Fiedorowicz can’t stay healthy and has major concussion problems to the point that there is legitimate retirement talk. This opens the door for Anderson, the converted wide receiver, to get the opportunity to start at for the Texans in 2018. He’s better running routes than blocking so when he’s on the field he’s going to be getting targets. If Anderson is at the top of the depth chart going into the season, I’d take that as a big vote of confidence and he’d be worth keeping an eye on. Mark my words, George Kittle will be a top 10 tight end next year, chisel it in stone. In a position where rookies usually flounder Kittle had 43 catches for 515 yards and that was with questionable QB play. Further, the receivers under contract for next year on the San Francisco offense aren’t red zone guys, as Pierre Garcon has only managed to hit 6 touchdowns in a season and Marquise Goodwin, the speed guy, has only caught 3 touchdowns in a season. Next year brings the second year in the offense and a full year with Jimmy the Greek. There will be a lot of touchdowns that need to be accounted for, so I expect Kittle’s fantasy point total to jump high enough to catch one of Dak Prescott’s overthrows this year (that’s high). Don’t wait on Kittle grab him just after the big names go off the board. Tyler Eifert has held Kroft back, but Eifert is a free agent and with Kroft’s emergence this year, it looks like Eifert is expendable. Kroft is a fourth-year guy who can take the next step next year and is a guy Dalton looks for in the end zone as he finished with 7 touchdowns on the season. 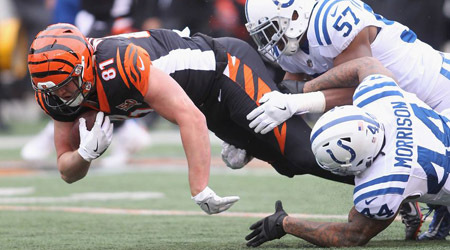 The Bengals offensive line was awful this year, and Kroft is known for his blocking. With any improvement to the offensive line, Kroft should get a bigger offensive opportunity and not have to stay in the backfield as long to block or chip rushers. I’d be confident drafting Kroft as a mid-range tight end and expecting a bump in this year’s numbers. Free Agent, injury prone Tyler Eifert is probably going somewhere new in 2018, as he hasn’t been able to stay healthy and is a true boom or bust fantasy pick. I know not many of you would label him as a sleeper, but depending on his average draft position or trade value, he could be a candidate for comeback player award. When Eifert does get on the field, he puts up numbers. Eifert has averaged more than a touchdown in every other game and people concentrating on his injuries may forget that in fantasy points per game in 2016 he trailed only Rob Gronkowski. When healthy Eifert deserves a spot on your roster, just don’t count on him to play every week.